(Fort Washakie, Wyo.) 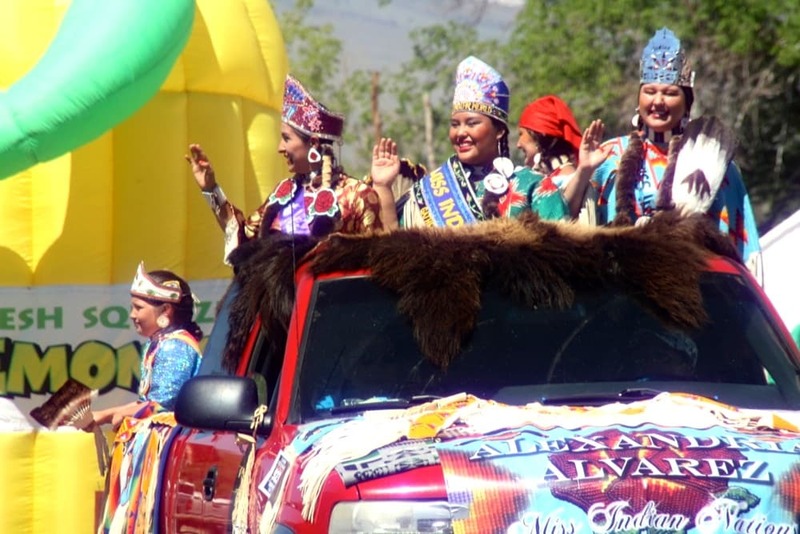 — The 55th annual Eastern Shoshone Indian Days concluded this weekend, wrapping up three days of dance contests, drumming and singing. 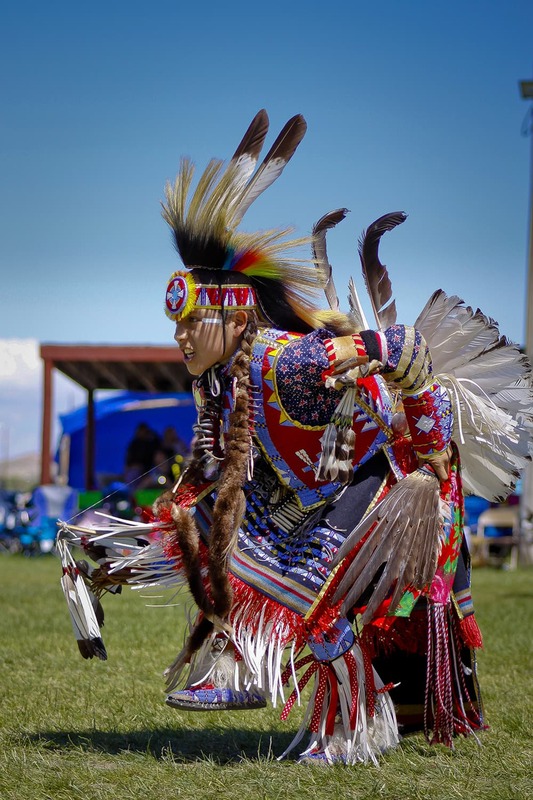 The celebration, which is the biggest powwow in Wyoming, is a defining event for the Eastern Shoshone, and one of the largest reservation-based powwows in North America. Thousands of attendees came from near and far to take part in the dancing, music, and food, where they mingled with old friends and made new ones. Like all powwows, the event is intended to be fun, but it also takes on the serious role of uplifting the hearts of the Eastern Shoshone and all their visitors. Throughout the day, organizers and announcers of the event spoke to the healing power of the powwow. The event went off smoothly and professionally. Dancers found green grass to dance on. Vendors had plenty of electricity and water. Onlookers had shade over their heads and good places to camp. The arena directors and the emcees and drummers all worked together to keep Sunday’s event moving for more than 10 hours straight, wrapping up after midnight. “We invested thousands of hours to build that celebration to what it is today,” Abeyta said. The salty smell of french fries wafted through the air on the final morning of the powwow before the dancing started. Drum songs and Indian Elvis played over the loudspeakers of the dance arbor, mixing with rap music that thumped from a car rolling through the campground. People stood at tailgates, putting on regalia for the parade. Many draped colorful blankets over their vehicles. The American Legion Color Guard kicked off the parade by leading a procession into the dance arbor. Gilbert Jarvis carried in the eagle staff. Throughout the year he’s responsible for maintaining the powwow grounds and keeping the grass green. Following behind were the other members of the guard, who said they had represented the Eastern Shoshone during the inaugural parades for George Bush in 2005 and Barack Obama in 2009. As the parade ended, the crowd moved over to Rocky Mountain Hall for a feast put on by the powwow committee. Eastern Shoshone elder Star Weed, Sr., opened the meal with a prayer for safe travels, asking for a blessing over the food and the water. He prayed in Shoshone and in English. About 200 people lined up in the gymnasium to eat, with out-of-state guests asked to eat first. 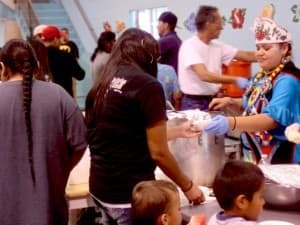 Those serving food to the crowd included volunteers and Rhyia JoyHeart-RunsMedicine, the recently elected Eastern Shoshone Indian Days Princess, who comes from Denver, Colorado. Sitting at one of the long tables at the feast was Edmund Nevaquaya, a Comanche from the town of Apache, Oklahoma, who was one of this year’s powwow emcees. 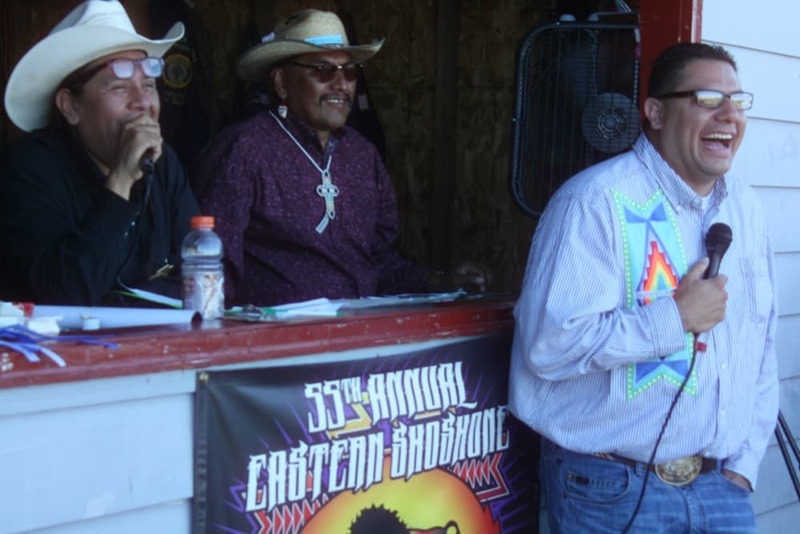 He’s a long-time powwow emcee, and said he first attended Eastern Shoshone Days in the early 1980s. Nevaquaya explained that the Comanche and the Eastern Shoshone share a language. At one time they were part of the same people, before the Comanche migrated out onto the southern Great Plains. 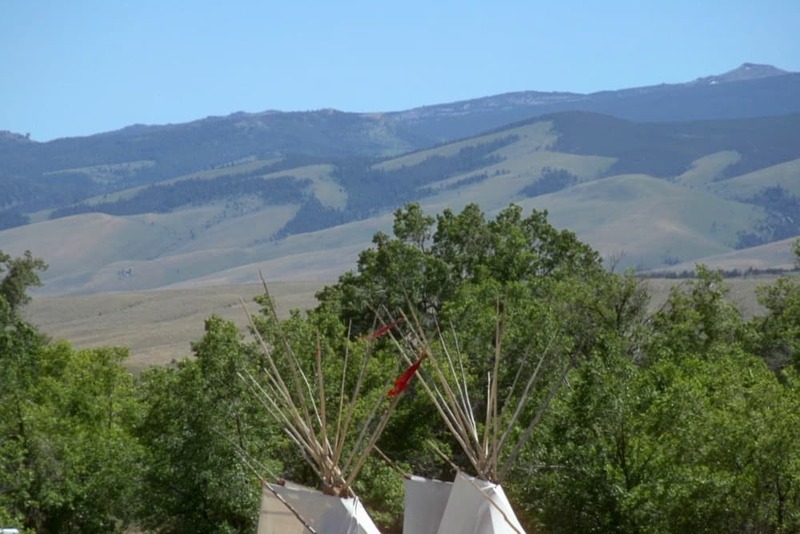 He said his part of Indian Country also has connections to the Wind River Reservation because of the Fort Sill Indian School, a federal boarding school that recruited Eastern Shoshone students until it closed in 1980. Further down the table sat Joanna Tillman and John Timbana, who were visiting and looking over some of Timbana’s beadwork. Timbana was raised partly on the Fort Hall reservation, and partly with Eastern Shoshone relatives in Fort Washakie. He said he learned beading from his family and in school. He now lives in Nevada, and makes moccasins as a sideline. They sell for $450 a pair, and he has more orders than he can keep up with. Tillman said “everything is changing” when it comes to beadwork on powwow regalia. Traditional beading requires stitching every two beads to the backing, and is very labor intensive. Timbana said many people now use larger beads and stitch only every three or four beads to the backing. 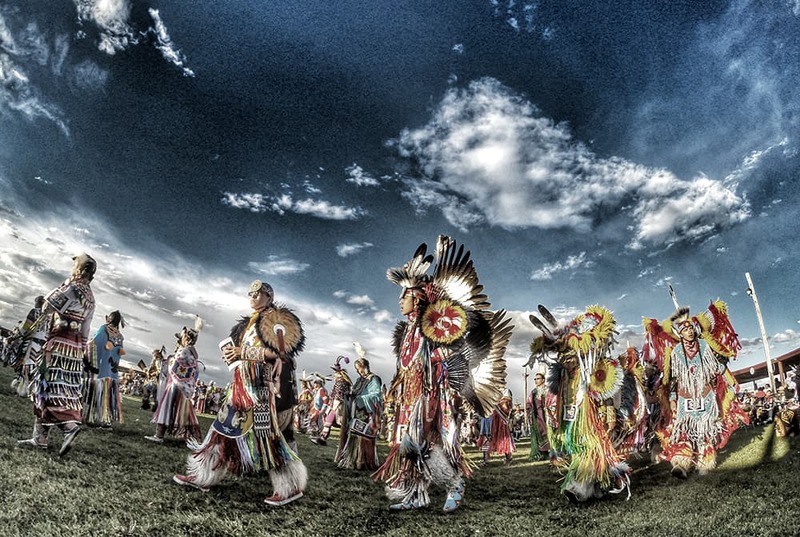 Every day of dancing at a powwow begins with a grand entry, where all dancers line up according to the style of their regalia and dance into the arbor. The honored member of this year’s procession was Finn Snyder, a WWII veteran who is one of the oldest living Eastern Shoshone men. He served in the Aleutian Islands as an Army engineer. Born in 1915, he will turn 99 years old this July. He’s been a member of the American Legion Post 81 for 65 years, joining just a few years after the organization’s founding at the end of World War II. As the grand entry began, the eagle staff carrier Gilbert Jarvis led the procession, with Snyder flowing behind in a wheelchair. Then came the color guard and all the powwow royalty, including the reigning Miss Indian World Taylor Thomas, and Miss Indian Nations Alexandra B. Alvarez, both Shoshone-Bannock from Fort Hall, Idaho. Leading the dancers were head woman Miss Native American U.S.A. Sarah Ortegon of Denver, and head man dancer Jalen Abeyta, son of powwow coordinator George Abeyta. The grand entry dancers followed behind them by the hundreds. Emcees Edmund Nevaquaya and Ruben Little Head (Northern Cheyenne) from Lame Deer, Montana, announced the action and called on different drum groups to play. 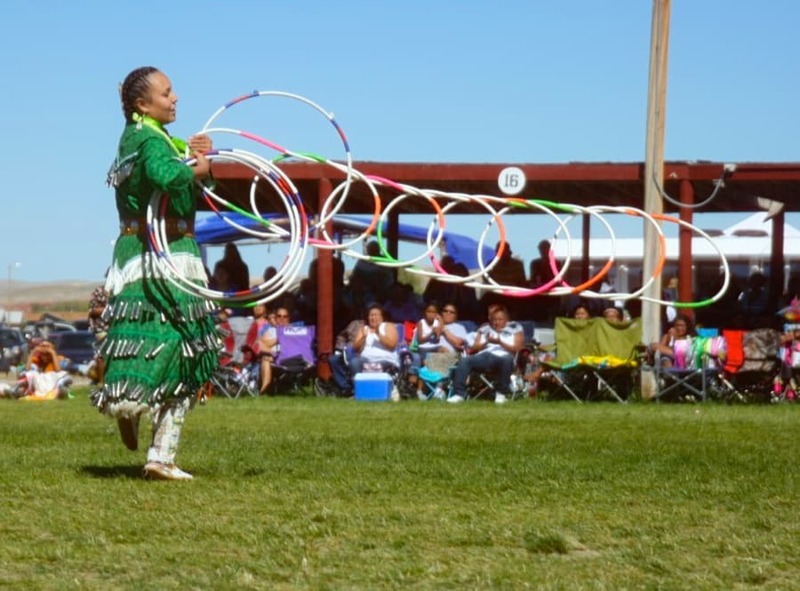 Following the grand entry, dance contests ran throughout the afternoon and into the night, with a number of specials including the hoop dance special, which came with a prize purse of $1,500. The top hoop dancer, Brando Jack (Diné) donated part of his prize to the Wildhorse Singers, the Northern Host Drum from North Battleford, Saskatchewan. Jasmine Bell (Crow Creek Sioux) of Riverton won second place and $1,000. The last dance contest of the night was a clown dance, an event in which dancers dress up in spoof costumes and try to make the audience laugh. Those dancing in the event included Ethan Fighting Bear, who was wearing a construction vest and a Halloween mask. He came in first and won $100. A man in a shawl and skirt made of plastic garbage bags won second place and $50, and a dancer dressed in a Chewbacca hoodie won $25. 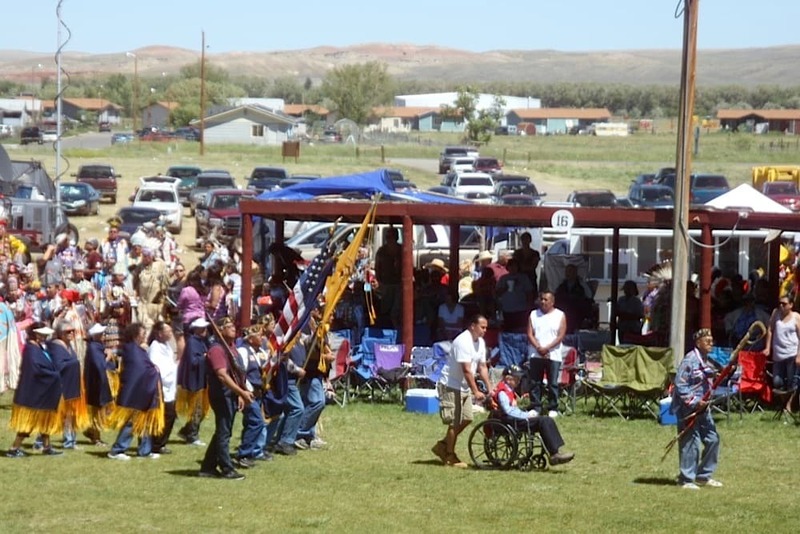 Abeyta said Eastern Shoshone Days powwow reached a peak in 2012, with more than 1,000 registered dancers. 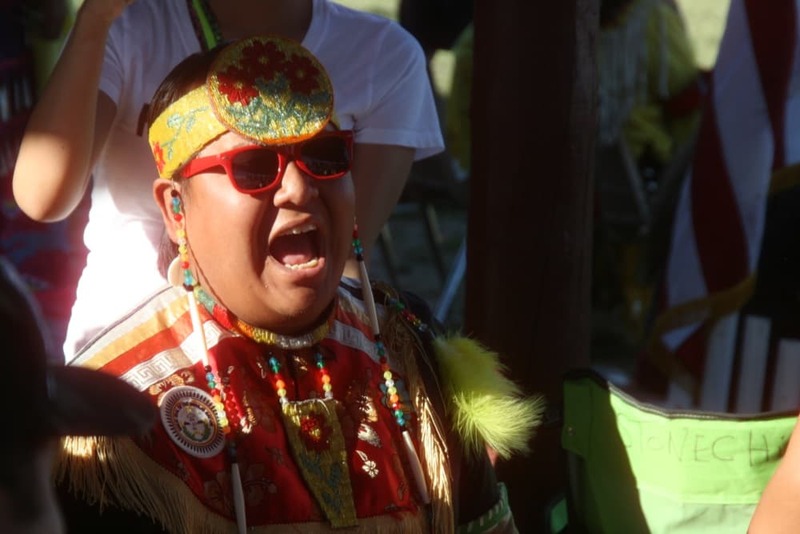 This year 483 dancers signed up for dance contests, but hundreds more participated in the grand entries and intertribal dances. 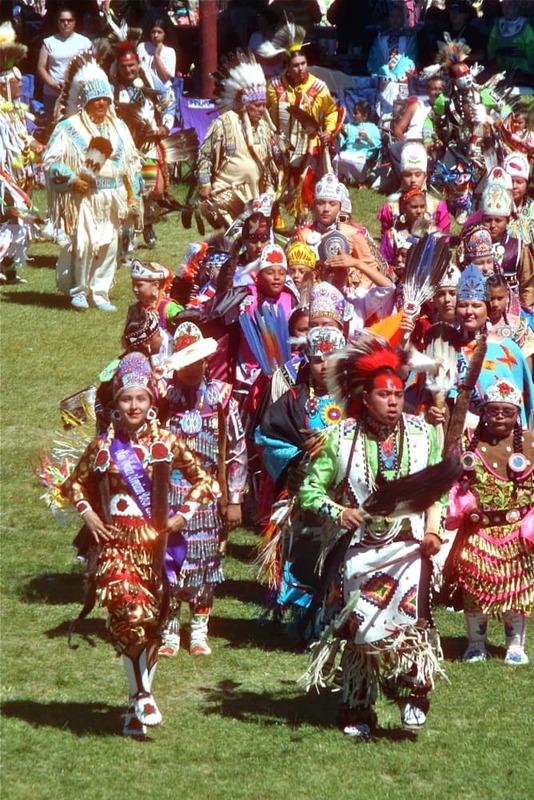 Still, the powwow is much larger than it was a eight years ago, when there was only one line of dancers in each grand entry. Now there are six lines of dancers in the grand entry. 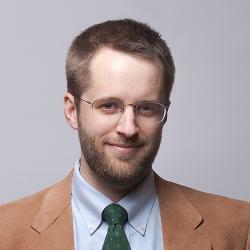 “We wanted to see it get bigger and better,” said Willis “Weasel” Man, a member of the entertainment committee. 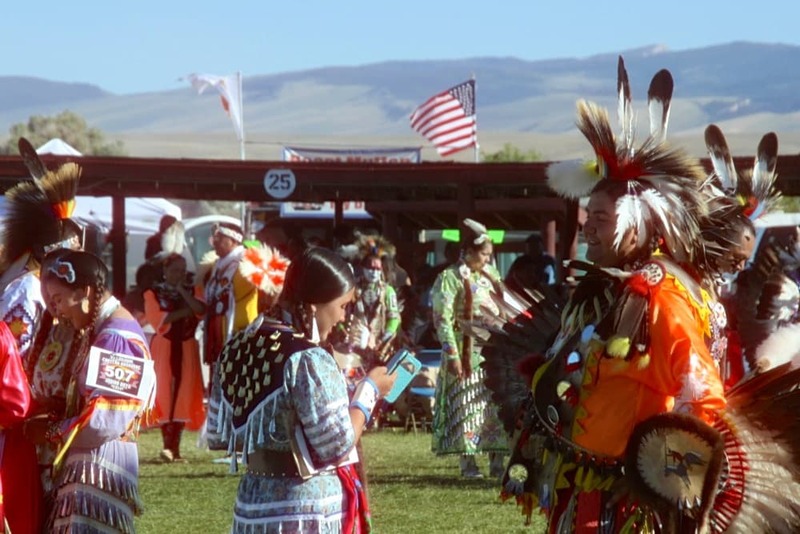 “We are drawing a lot of out-of-staters.” He estimated at least 20 states are represented at the powwow, coming from places like Montana, Colorado, Idaho, Nevada, Utah, New Mexico, Arizona, Oklahoma, Texas, Iowa, and Canada. I commend you for the abundance of photos, which provide the ambiance of the Eastern Shoshone Powwow event for ‘the rest of us.’ Your text is informative, and your photos capture the expression of joy of the people celebrating their culture with other individual indigenous cultures in attendance as both participants and attendees deepening in Shoshone culture. Direct cross-cultural learning at its best is participating! Visuals are worth a thousand words. 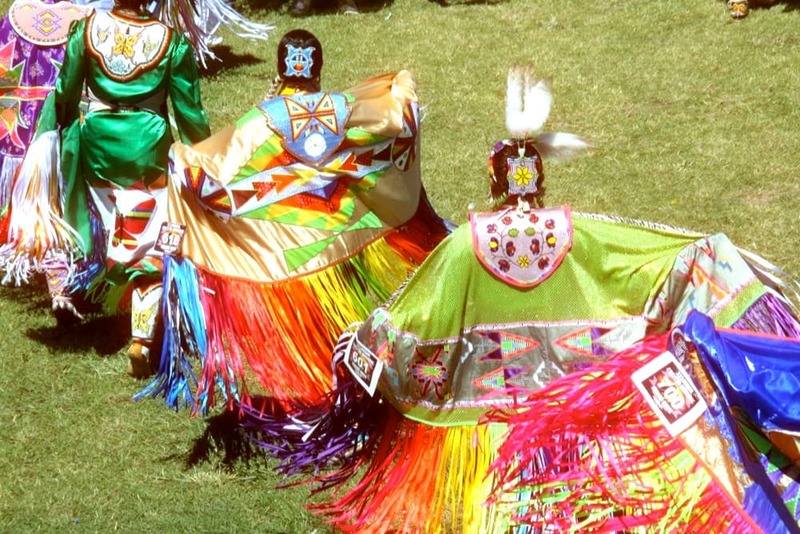 Many thanks to the Powwow Committee for their offering of thousands of individual hours to create these annual entrepreneurial cross-cultural events.